You've all heard the song, "It's the most wonderful time of the year". While Andy Williams may have been into the season when he sang this, the holidays aren't always so tranquil! Most people do not think about severe weather as the holidays approach. They are concerned about whether all the gifts have been bought and have arrived, how long will the line be at the post office to mail gifts and cards, is the wrapping all done, what will they cook for Christmas and other Yuletide thoughts. However, December is still a time when tornadoes can occur. 1982: The "Eye of the Tiger" is a popular song, Knight Rider is on TV, the Weather Channel airs on cable and 96 tornadoes occur in December. One tornado, on Christmas Eve, travels from Arkansas to Missouri and is rated an F-4. 2002: Nickleback has the top song of the year, the Harry Potter and the Chamber of Secrets movie debuts, Salt Lake City hosts the Winter Olympics and 97 tornadoes occur in December. 2012: We all get the song "Call Me Maybe" stuck in our heads, Hurricane Sandy devastates the East Coast and 53 tornadoes occur in December. A tornado outbreak on Christmas Day, with 30 confirmed tornadoes, happens in the South. Now, let's come back to the present year of 2015. 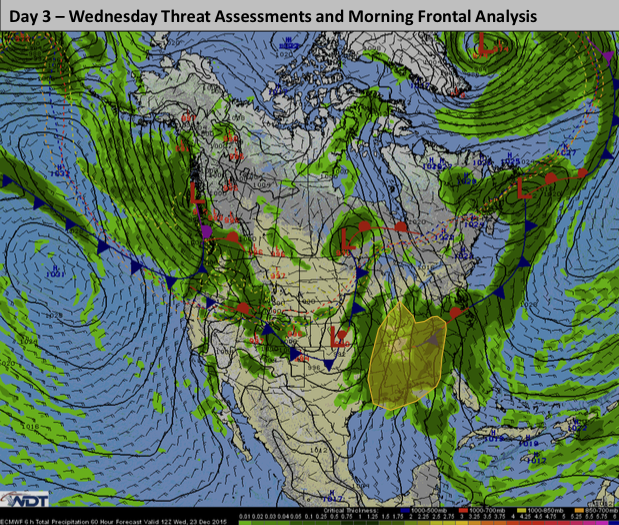 As seen below, the current forecast Wednesday, December 23, contains a threat for severe storms occurring in the area from Northern Louisiana to the Tennessee Valley. Moisture and instability should be sufficient to produce supercell thunderstorms. With many traveling to visit family, it's a good idea to keep an eye on this weather system. One way to stay weather aware is to follow the WeatherOps forecasts. If you need site specific information for your company, consider contacting these WDT Meteorologists. Another way to be prepared is to download our Weather Radio mobile app, an extremely useful way to know where warnings are occuring. So, while there may be parties for hosting and marshmallows for toasting, don't forget to add weather for watching!